High-flying BMX bikes piloted by X Game gold medalists brought home the anti-bullying message to thousands of Kansas City area high school students in the middle of the month. 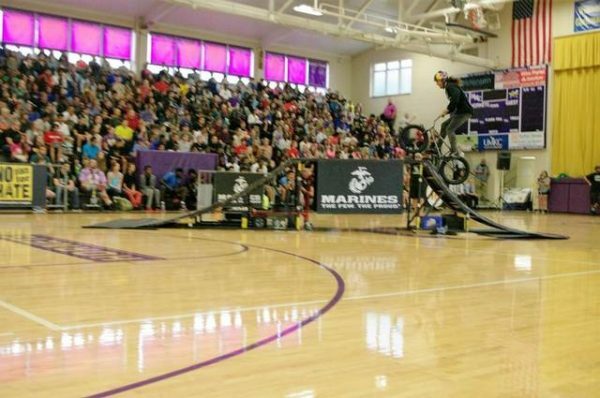 The Action Sports Association Entertainment group partners with the Anti-Defamation League and the U.S. Marine Corps on a 14-week high school tour to capture the attention of students and convince them to be aware of the dangers of bullying, particularly online. BMX bikers from three different countries performed complicated tricks inside the North Kansas City High School gymnasium in the name of educating about the dangers of bullying on Sept. 9. The group included three-time X Game gold medalist Trevor Meyer, who specializes in what he calls “flatland” tricks on his BMX bike. The Minneapolis resident started working on tricks in his driveway when he was about 12. As an adult, he walked onto the X Game stage and took the top spot in competition. He says he does the tour because biking helped him as a teen. Fellow Action Sports Association performer Dustin Grice, who is also from Minneapolis, says there are more kids on skateboards these days than playing baseball. Students who are fans of the X Games already know the athletes, because the riders in the tour are the same riders featured on TV. Grice says the shows are exciting for the students, but can also be a very effective teaching tool. “It’s crazy to see what kids are taking in while they are watching the show,” Grice said. Grice gives stats and information about what cyber-bullying looks like during the performance. Prizes are offered for people who can remember the information at the end of the show. North Kansas City High School Student Council Adviser Corey McCun says the student council used the assembly as an opportunity to raise awareness of bullying in the week leading up to the event. They posted signs around the school to help fellow students be aware of the impact and dangers of bullying. North Kansas City High School has about 1,500 students. The ASA tour also visited other high schools in the Kansas City area. The tour takes the athletes across the county.